The Comras Company is excited to announce it has recently signed 8 lease transactions at the New Pembroke Centre. The ± 38,000 SF regional retail center will be home to well-known retailers and popular restaurants including Firebirds Wood Fired Grill, Venetian Nail Spa, AT&T, Pieology Pizzeria, CREAM (in lease), The Habit Burger Grill, Comcast/Xfinity, TooJay’s Original Gourmet Deli and Twin Peaks Restaurant. 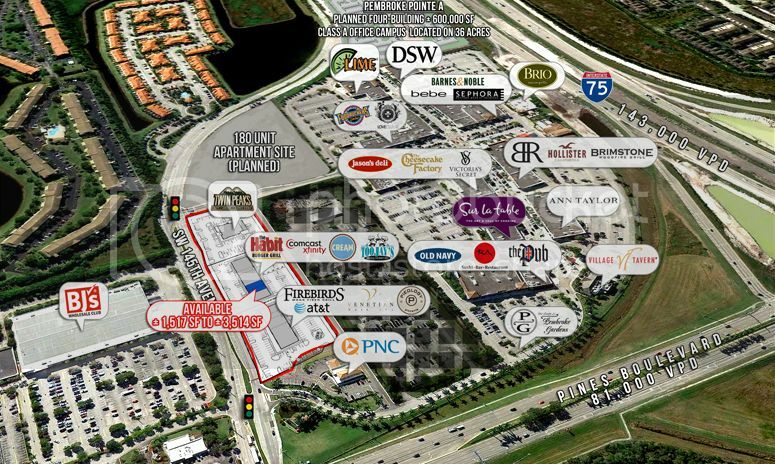 The project, situated at the main entrance to The Shops at Pembroke Gardens, is now more than 90 percent leased, said Jeff Evans, Senior Director of Retail Leasing of The Comras Company, who is the exclusive agent for the retail center. The New Retail Center is expected to deliver first quarter 2016. Join this exciting mix of retail/restaurants! There are only two spaces remaining. For more information contact Jeff Evans at (305) 532-0433 or via email jeff@comrascompany.com.